When my daughter Audrey was an infant, some people jokingly called me a “tiger dad” because I kept trying to make her do things she obviously could not do yet, like trying to get her to lift her head when she was a week old. I really wanted her to be more advanced for her age, a feeling many first-time parents experience. Unfortunately for my new son Benji, I have swung the opposite direction and just figure he’ll learn to do things eventually. I guess my tiger dad days are over. Fear is a huge barrier to doing the work of God. Many of us have a fear of failure, a fear of not being good enough, of looking foolish. Yet, when that is our attitude, we are being self-centered because we are putting the focus on ourselves. 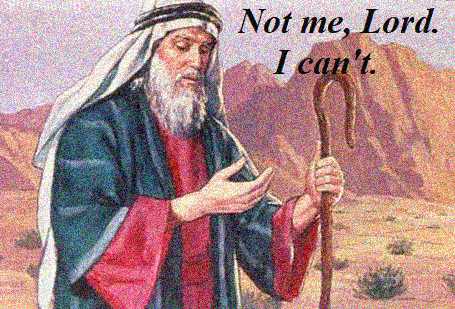 Moses was being very self-centered – His response was “I cannot do that. I am not the right person.” But it’s not about being the right person; our God is the right God and whoever He calls is the right person for His work. Why? Because God goes with whoever He calls. He enables them to do the task. After Jesus ascended into heaven, the early church did not run around trying to do things that Jesus did. They prayed and waited. Eventually, at Pentecost, they were all filled with the Spirit and empowered to do the work of growing the church. God was with them. Though it seemed impossible, God enabled them to do something that seemed impossible. In the same way, perhaps God is calling you to do something. Remember that you have the potential of God within you. He will enable you to do whatever He calls you to do. Prayer: Thank You, Lord, that You send Your Spirit upon me to do Your will. On my own, I would fail, but with Your Spirit I have Your potential within me. May I never fear failure knowing that You will carry me through Your purposes. Read Exodus 31:1-4: The Lord said to Moses, 2 “See, I have called by name Bezalel the son of Uri, son of Hur, of the tribe of Judah, 3 and I have filled him with the Spirit of God, with ability and intelligence, with knowledge and all craftsmanship, 4 to devise artistic designs, to work in gold, silver, and bronze, 5 in cutting stones for setting, and in carving wood, to work in every craft. What did God call Bezalel to do? How did God enable Bezalel to do this? Is the Lord calling you to do something right now? God called Bezalel “to devise artistic designs, to work in gold, silver, and bronze, in cutting stones for setting, and in carving wood, to work in every craft.” God was planning to build the tabernacle which was basically a tent that the Israelites would carry with them as their place of worship, and it also was God’s symbolic presence with His people. Verse 2-3 tells us that “[God has] called by name Bezalel the son of Uri, son of Hur, of the tribe of Judah, and [He has] filled him with the Spirit of God, with ability and intelligence, with knowledge and all craftsmanship.” Was Bezalel a skilled craftsman before God called him? We don’t know, but he likely was not good enough to do what God called him to do. If you have read these chapters in Exodus, you know that the design of the tabernacle was very intricate. Bezalel needed the power of God through the Spirit to do this. God called Bezalel and gave him the ability to do the task. Take time to reflect on this question. Invite the Spirit to speak to you and give you confidence that God will equip you for all the work He wants to do through you. As you get ready for bed tonight, consecrate tomorrow to God. Say to Him, “God, I want to do what You want me to do tomorrow. Fill me with Your Spirit that I may do it by Your strength.” Imagine praying that prayer every night; God would certainly use you in mighty ways!